These dolls sometimes have a body tag that identifies the brand (not the body type). Many are marked on the back of the neck (but that identifies the head mold, not the body type). This body type is used for the 18" American Girl dolls so it is one of the easiest to find patterns for since they are so popular. This body type is called '18" articulated soft body standing' by Götz, the originator of this body type. 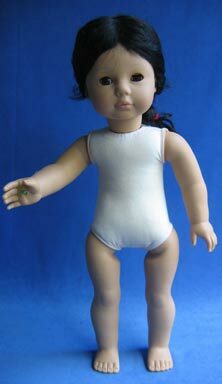 Götz used this body type for many years for its own dolls before producing American Girl dolls for Pleasant Company. Maplelea Girls, which can share clothes almost perfectly with this body type.